NFL Puts Anthem Policy On Hold After Backlash - Joe.My.God. The league and the NFL Players Association issued a joint statement Thursday that said “no new rules relating to the anthem will be issued or enforced for the next several weeks” while both sides continue to hold discussions to figure out how to move forward. “The NFL and NFLPA, through recent discussions, have been working on a resolution to the anthem issue,” the joint statement said. “In order to allow this constructive dialogue to continue, we have come to a standstill agreement on the NFLPA’s grievance and on the NFL’s anthem policy. The Dolphins said in a statement: “The NFL required each team to submit their rules regarding the anthem before their players reported to training camp. We will address this issue once the season starts. 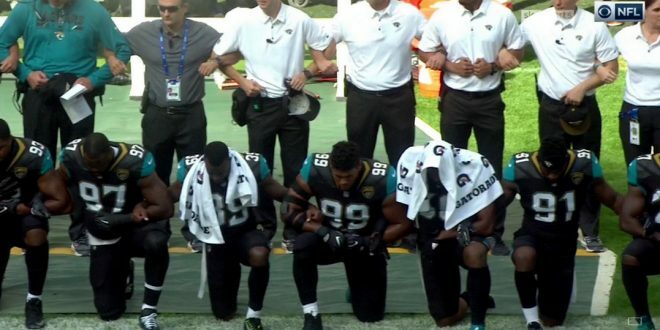 All options are still open.” The NFL rule that was passed in May forbid players from sitting or taking a knee if they are on the field or sidelines during the national anthem, but allowed them to stay in the locker room if they wish. The new league rules were challenged this month in a grievance by the players union.